Autobot Teslor increases the genius of Brainstorm, making his brilliant inventions even more advanced. Brainstorm is yet another character I completely missed out on as a kid, and wasn’t truly aware of his existence until the recent run of IDW’s More Than Meets The Eye series where he was part of the crew of the Lost Light. Sure, he was in three episodes of Season 4 of The Transformers, but he really didn’t do anything memorable. In the IDW-verse, however, Brainstorm seemed like an interesting character but didn’t quite strike a chord with me – that’s not to say I didn’t enjoy him because… er, I bought a toy of him anyways. As far as toys are concerned, Brainstorm has had very few iterations over the course of the franchise. Debuting as a Headmaster partnered with Arcana in 1987, Brainstorm wouldn’t see another toy release until Thrilling 30 in 2014. That toy was a Voyager class figure and again featured his Headmaster Arcana (though the actual Headmaster was unnamed on the box) and was modeled after his IDW appearance. 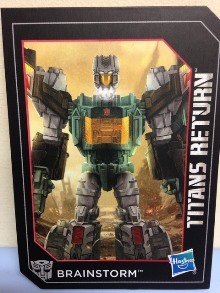 I missed out on that one – not even sure he made it to stores in my neck of the woods – so I’m pleased I was finally able to get my hands on smaller, slightly less expensive Brainstorm. The kicker here is that Titans Return Brainstorm is a retool/repaint of TR Blurr, and was initially made as a Hasbro Toy Shop exclusive around SDCC 2016. Today’s toy is a repaint of that exclusive figure – as another exclusive found only at Walgreens, and Arcana has been renamed Teslor, presumably for trademark reasons. Hasbro really makes it hard to get this guy, eh? 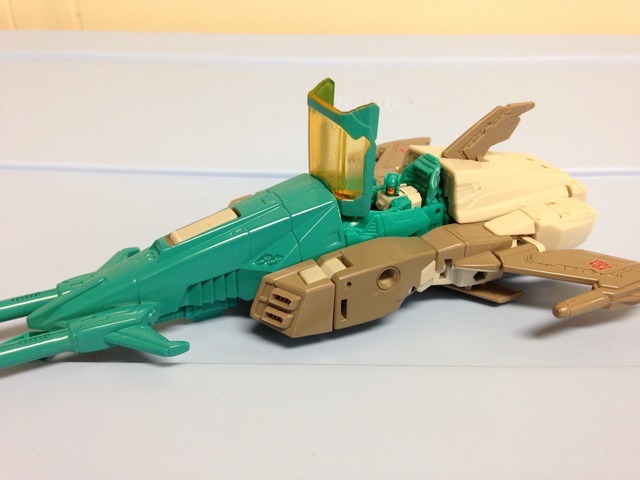 Brainstorm’s alternate mode is a Cybertronian jet. Truth be told, it looks pretty good. Yeah, it looks stubby for a ‘jet’, but it looks pretty close to the original… at least from the photographs I have seen. Brainstorm carries the base engineering of Blurr with quite a few differences like the wings on the sides and the nose of the jet. The rest is basically the Blurr figure, but it works rather well. The main exception there is how the cockpit fits together; on Blurr the back of the cockpit windshield is left open a crack, which is fine for a fast ground vehicle. On Brainstorm – a space jet – an open cockpit is a bit of an oversight. I don’t think the engineering would work quite as well had it been filled out, so if you can get over that little issue you’ll find a fun toy. One other minor bit that is missed from the original (and the T30 version for that matter) is the back end of the jet features only one tailfin – both of the former versions had two. It’s really a minor thing, and it doesn’t bother me at all. The jet mode is pretty tight all around (except for the gaping cockpit) and it has some tiny little wheels on the bottom to roll it around. They ‘function’, but don’t work at all on carpet. Brainstorm’s gun can peg into the 5 mm holes on his sides or (as I prefer) it can be pegged underneath the nose of the jet. As mentioned previously, Teslor can ride around in the cockpit, and he sits in there snugly enough to not rattle around. Brainstorm’s coloration in this version is quite close to the original – much closer in my opinion than the SDCC version. The back end of Brainstorm is a very light grey that blends into some darker grey on the middle and sides, and finally into teal on the front. The cockpit is done in transparent yellow like his G1 toy, and you can easily see Teslor in there. The molded detail on Brainstorm is done rather well, as most TR figures have been. There are panel lines and little mechanical details like vents here and there. Paint apps are nearly non-existent in the jet mode, save for two tampographed Autobot symbols on the wings. Overall, the jet mode is pretty good, but it does have a few minor issues. 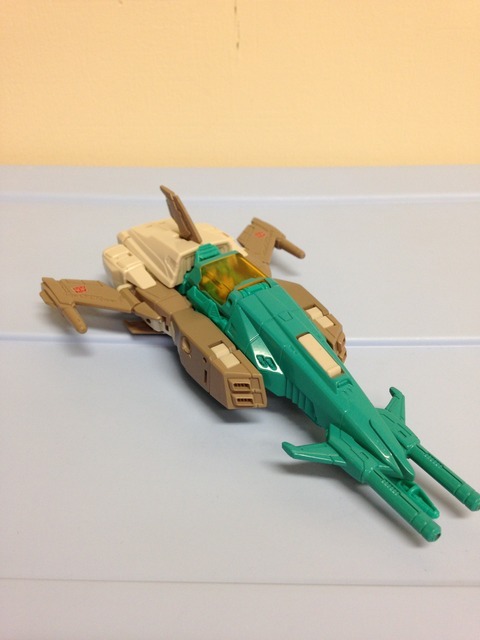 If you can overlook those things, Brainstorm’s jet mode is pretty decent. If you’ve got TR Blurr, you’ll find the same engineering taking place – actually if you own some CW and TR figures already, you’ve likely seen quite a bit of this engineering. 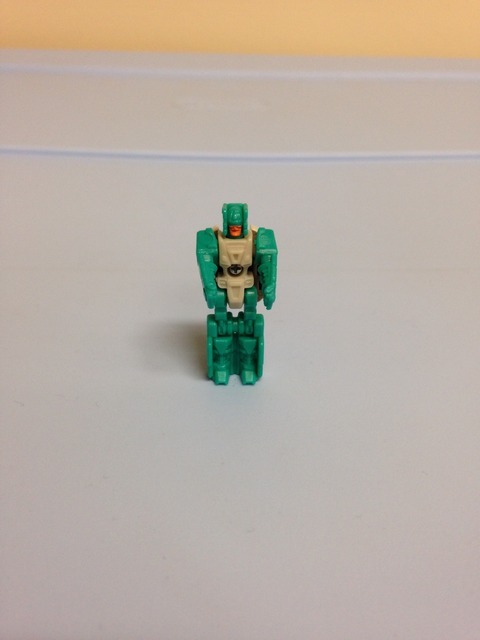 Brainstorm’s arms fold out from the sides much like TR Triggerhappy, where they can hang out for a bit. Brainstorm’s leg engineering is very similar to that of the CW Dead End and TR Chromedome molds – open the shins and flip out the legs, close the shins and flip the feet down. Once the legs are open, the nose of the jet can either be removed from its peg or simply folded onto his back. Then the arms can be shifted up to the shoulder area where they belong and rotated down. There’s a couple of little ‘casings’ that need to be folded back to reveal his hands, but after that you can attach Teslor to the neck and you’re good to go. There’s not a whole lot that’s special or new going on with Brainstorm’s transformation, but it’s easy, fun, and not even remotely frustrating. When in robot mode, Brainstorm is sleek and well proportioned (mainly due to sharing the mold with Blurr). I believe all the robot parts are the same from Blurr to Brainstorm, with the exception of the shoulders. Those parts have been retooled to contain two small ‘wings’ molded onto the front, and the sides of the shoulders have been modified to support the side wings of the jet mode. Both of these components were done to mimic both the original toy, and perhaps more fittingly the IDW/T30 design. It fits the latter quite well. The color palette from the jet mode carries over to robot, with the legs retaining the light grey coloration – the shins are left unpainted save for a couple tampographed designs to match the G1 toy, and I must say, the tampos are very crisp. The detail is rather amazing, and it’s matched in the shoulder wings (more on that in a bit). The main torso is teal with a small Autobot symbol in the lower abdomen, and the yellow windshield makes up the chest. Sadly, the chest is rather cavernous, whereas the T30 version contained the SPD/STR/INT detailing of the original figure. Something like that would have been awesome here, but I understand the lack of detail as the small cockpit is designed to seat a TM figure and would probably rub off with play. In robot mode, the upper arms still retain a bit of light grey, whereas the added wings and forearms are done in a darker shade. 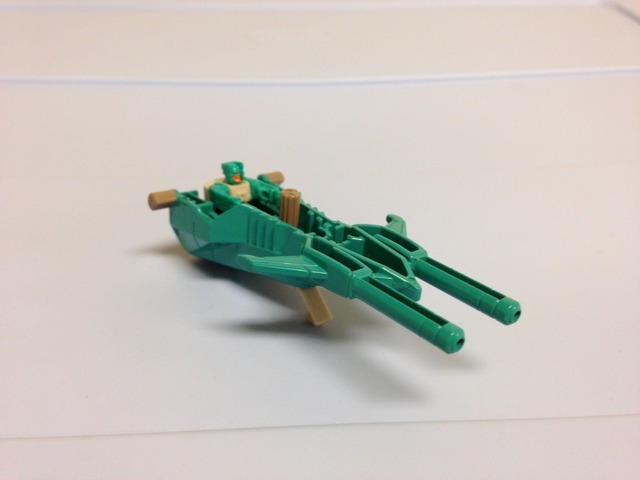 As mentioned before, there are some nice tampo designs on the side wings, which are incredibly well done and match the design of the original toy. The head mold is nicely done and is designed to resemble his IDW appearance. The outer part of the face is painted to match the light grey, and the faceplate is done in a light orange/yellow color. As a fantastic addition, the eyes are painted light blue. Aesthetically, I think Brainstorm has a good mix of both the Generation 1 and IDW designs to please most people. Brainstorm has a decent amount of articulation, with hinged knees, swivel thighs, and ball jointed hips. The elbows hinge as well, the upper arms and wrists twist, and the waist twists too. The shoulder, unfortunately have a similar design to Triggerhappy, where they’re not really on ball joints. They have a good range of motion, but getting them into certain positions is tricky, and you have to do some twisting and jostling to get them right. There would be a more free range of movement had they been designed with ball joints, but honestly, the rest of Brainstorm is so good that it ends up being a minor issue (and one that you can get around with some finesse anyways). Brainstorm’s head is nice and tight in the TM socket – something that can’t be said across the board in this line. He also comes with two accessories – the blaster rifle that came with Blurr, and a modified shield much like Blurr. The former is just fine, but the latter is unwieldy. First, Brainstorm never had a shield to begin with, second, it’s pretty darn big so if you peg it to his forearm you’re in for a giant hunk of plastic hanging there. I prefer to leave it pegged into his back, which isn’t an issue from the front view, but if you look at him from the sides it presents some kibble. If that really bothers you, you can simply set the part off to the side and not use it at all. The main takeaway here is that, while not perfect by any means, Brainstorm is a solid toy and a bunch of fun to boot. Teslor, I would say, is slightly above your average TM figure. His robot body shares the same mold as Hyperfire (Blurr), Stylor (Chromedome), and Throttle (Breakaway), but I’m glad to report that Teslor actually has some paint on his face! This is becoming somewhat of a rarity with the line, and at least it helps give the little guy a bit of flair compared to some of his blank-faced colleagues. As an added bonus, he snugly plugs into Brainstorm’s body without issue, and the neck is not loose when attached. If you really want, you can place him in the boat that is the jet’s nose to act as his own little vehicle/weapon. It looks dumb, however, and pales in comparison to some other TM functionality. Transformation Design: 7/10. There’s a lot of reused engineering from other figures, but it’s still easy and fun to go back and forth. Overall it’s a really nice design. Durability: 8/10. The wings are a little thin, but I don’t think they’ll break except for a big tumble. I haven’t noticed any stress marks anywhere either, so Brainstorm seems pretty solid all around. Fun: 8/10. 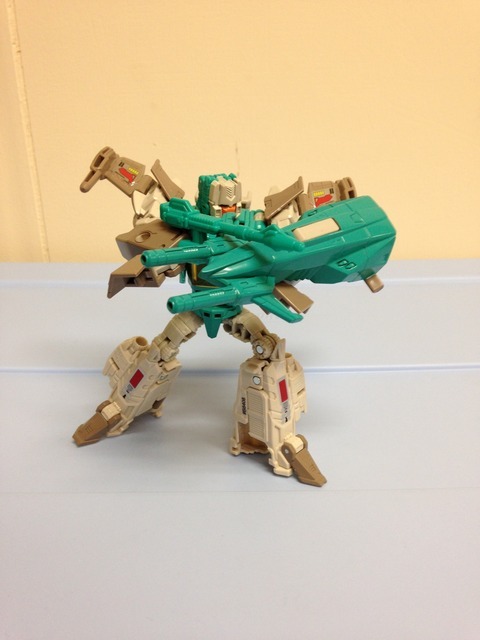 Brainstorm is sleek, has great articulation, and you can fiddle with other TM’s to have a bit of fun. The ‘boat’ that makes up the jet’s nose is a little doofy when it comes to play, but at least it’s there for you to enjoy. Aesthetics: 9/10. Personally I think Brainstorm looks great. He may not be everyone’s perfect cup of tea, but he’s got a good blend of both the original toy’s look and the IDW design to please people. The colors are simply great, and the tampo designs are some of the best I have seen. Articulation: 9/10. The shoulders are a bit wonky, but the rest of Brainstorm is flexible and unhindered. Value/Price: 5/10. Well, here we are, the first major stumbling block. 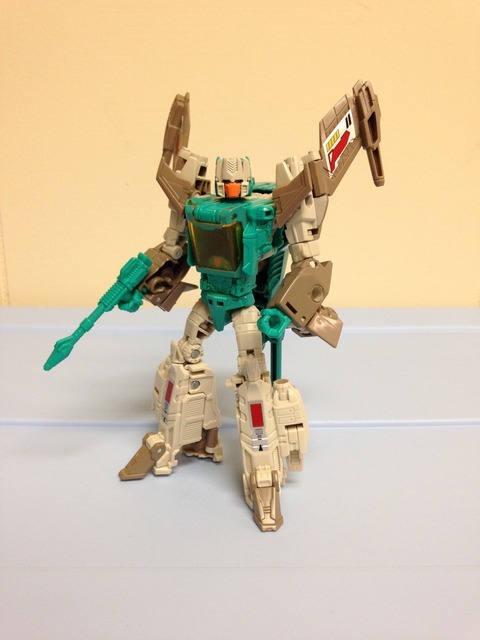 Brainstorm is a really great figure… but at the going rate of $17 USD, this is a hard sell. Walgreens is the only place that carries this release, and they typically overprice things. However, if you stumble across him during a random sale, or have a $5 off coupon or whatnot, I would suggest you get him. Overall: 8.5/10. Brainstorm really is a nice toy. I was a little lukewarm when I initially got him due to his higher-than-normal price, but I’ve really warmed up to this great design. Brainstorm has a lot to offer, and I don’t think you can go wrong with him.